March 24, 1989: An ecological disaster strikes. It was March 23 at 9:12 PM, William Murphy, an expert pilot, was in control of the wheelhouse. Joe Hazelwood, the captain, was present. Harry Claar, helmsman, was steering. Passage through the treacherous Valdez Narrows was uneventful. Murphy left and Hazelwood was in charge. Icebergs were encountered in the shipping lane. Hazelwood took the ship out of the shipping lane to avoid this problem. He then handed over control to Third Mate Gregory Cousins with “precise instructions” to return to the shipping lane by a certain point. Claar was replaced by Helmsman Robert Kagen. No one knows why, but the order to return to the shipping lane was not followed. 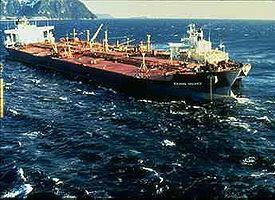 At 12:04 AM on March 24, 1989 the Exxon Valdez ran aground on the Bligh Reef. She was carrying 1,264,155 barrels of oil of which 257,000 barrels (10.8 million gallons) were spilled. It took four summers, thousands of man-hours, and $2.1 billion to clean up the mess. Many believe winter storms did more to clean the area than all the human efforts combined. The best estimate of the numbers of wildlife killed are as follows: 250,000 seabirds, 2,800 otters, 300 harbor seals, 250 bald eagles, 22 killer whales, and billions of salmon and herring eggs. The Exxon Valdez spill is still one of the largest in the United States. Although it has dropped off of the top 50 spills worldwide, it is still considered to be the worst spill when looking at the ecological ramifications. The worst oil spill disaster was intentional and occurred in 1991 when 520 million gallons of oil was released by Iraqi forces when they opened the valves of several oil tankers in Kuwait during the First Gulf War. The next three highest spills were due to pipelines issues in Mexico (100 million gallons), Trinidad and Tobago (90 million gallons), and Russia (84 million gallons). The worst ship disaster took place in the Persian Gulf in 1983 when a tanker collided with a drilling platform and 80 million gallons were spilled before repairs were completed seven months later. Also on this day, in 1898 the first American built car was sold in America – the Winton horseless carriage.